Bird's eye maple, curly maple, walnut, walnut burl, purple heart. This chest of drawers was made to be used as a file cabinet in my clients private home office. Each of the 18 drawers is constructed with hand cut dovetails and sequence matched curly maple veneer that I cut for the drawers fronts. The walnut burl is book matched veneer bordered with purple heart banding. The stand is walnut also with book matched veneer & purple heart. A matching desk is forthcoming. The view through the cellar entrance. 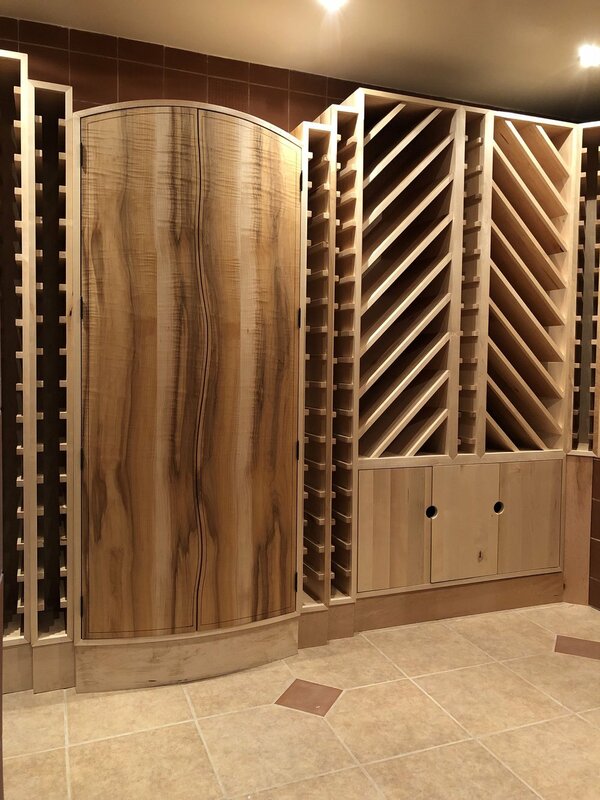 Made to be seen centred in the cellar entrance door, the main cabinet is curved & made of sequence matched curly spalted maple and purple heart banding. The central column consists of sixteen curly maple ribs. The treads & risers are of hard maple which cantilever our from the column. Mahogany shelving & entertainment cabinetry. Mantle piece designed in such a way as to leave exposed, as much as possible, the original fireplace brick. It includes design details that match the existing bookcase along the north wall and is also coloured to match. Constructed using reclaimed pine & hemlock, the intention was to create a piece with a worn, industrial feel. The boards were resawn & minimally finished so as to leave, as much as was reasonable, the original saw lines & wear marks. The suspended hemlock squares were dovetailed & held in place using coated steel cable, & the base is welded steel tubing with a matte black finish. Two board reclaimed pine harvest table. Legs include carved acanthus leaf. Reclaimed pine, yellow birch, spalted yellow birch. Detail showing carved acanthus leaf. Designed for storage & functionality, this piece incorporates both a deep set bench seat to enjoy some quiet time with a book or on the opposite side a writing & computer desk to perhaps search online for an as yet undiscovered literary treasure to add to ones reading list. Built for my clients home office this desk incorporates several bent laminations & LED lighting. The drawer fronts are book matched maple veneer salvaged from a local beach. The maple having washed ashore in the spring of 2016. The resulting colour patterns are quite striking. Maple, spalted maple, ebonized red oak. Maple, espresso stain, satin laqcuer finish. 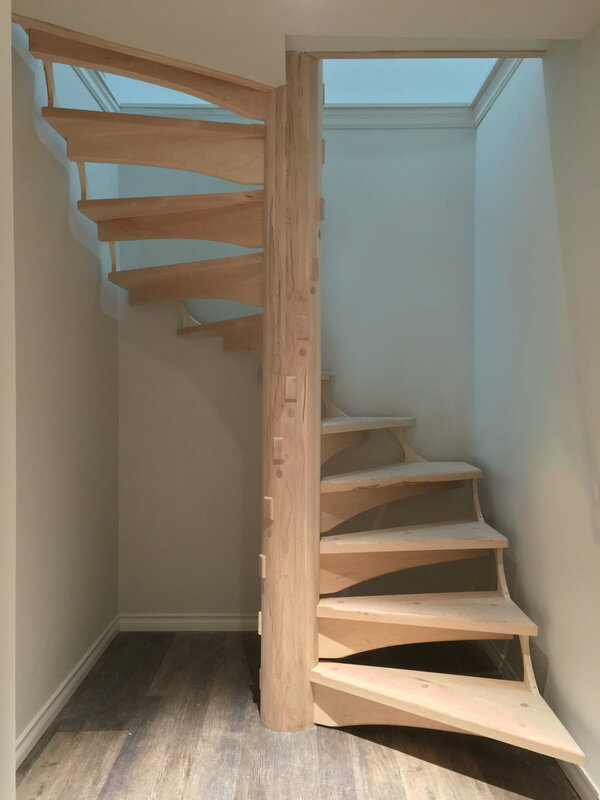 Oak staircase made with the jacobean style in mind. The gooseneck has a small braid detail carved into it on the top side. 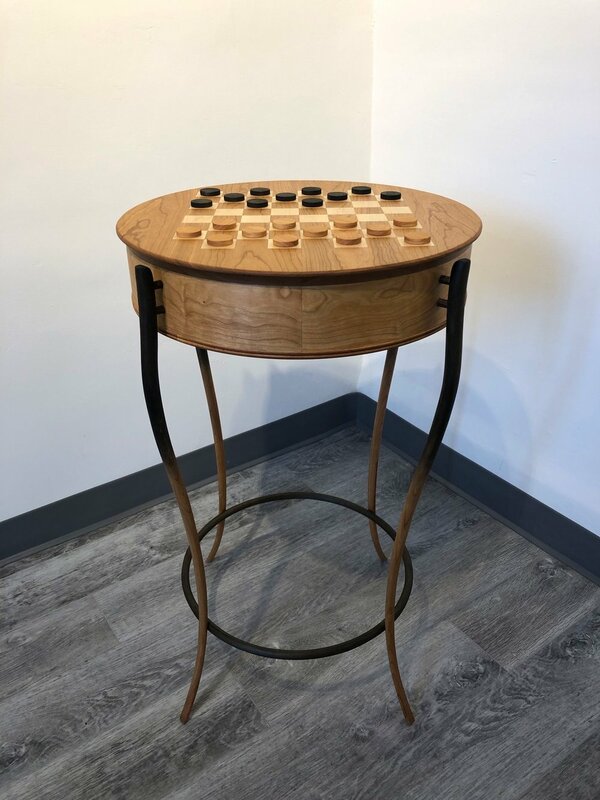 Games table made of cherry, ebonized cherry & curly maple. This piece is currently on display at the Colborne Art Gallery. It is offered for sale for $2250.